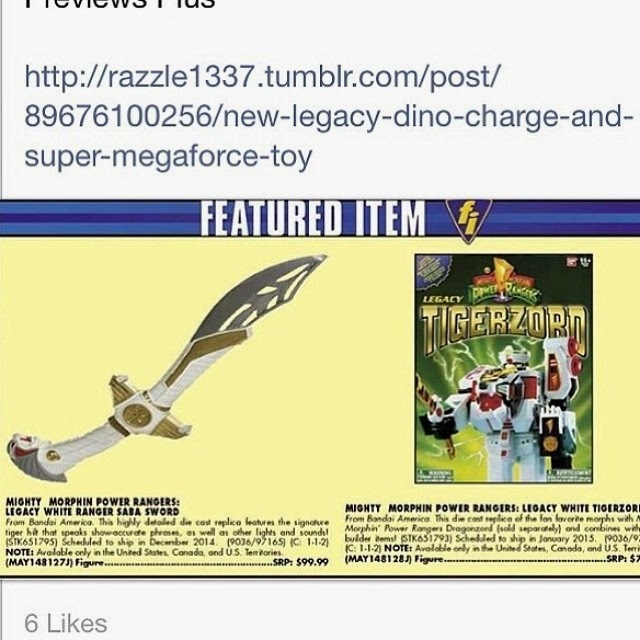 A rumor has been circulating the a Legacy Saba and Tigerzord has been floating around in The Toys R' Us database well now the White Ranger himself Jason David Frank has confirmed that on his FB page. Both collectibles look like they will retail for $100 each, and be die-cast metal like previous Power Rangers Legacy products. While we don't have a release date most likely expect these to be revealed at SDCC 2014 and available for sale sometime this Holiday season or Spring 2015. Thanks to the JDF FB page for the scoop! Oh Yeah more stuff for the extra sixth Ranger how exciting, when is Bandai oppression with Tommy going to be over with. Where is the Legacy Power Weapons, or the Power Blaster of the main five Rangers, or why is it the Legacy Tigerzord comes out before the Legacy Thunder Megazord?